This PVC drip irrigation system is great for in ground gardens, raised beds, hugelkultur, raised rows, Back to Eden, orchards, vineyard, greenhouse and more. In a backyard setting, or even a hobby farm, space is a big deal when it comes to growing food. Fruit trees use up a lot of precious space in a backyard or small hobby farm. High density planting is one solution to saving space while increasing variety. I found a great Youtube channel with a lot of good information. It is run by Oklahoma State University. 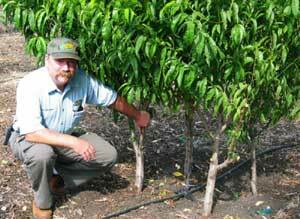 Here is a video talking about high density planting of fruit trees. Dave Wilson Nursery – What Is Backyard Orchard Culture?